I've been doing Manga Mondays every week since I started my blog almost 3 years ago. It started out as a personal feature, but I decided to turn it into a meme last year. There are quite a few people who do Manga Mondays. I don't claim by any means that I owned or created the idea of Manga Mondays - it's an obvious choice given the alliteration. I think a meme is a great way for everyone to publicize their own Manga Mondays and get a little more publicity. I'm increasingly liking this series. It has a more realistic feel to it than the silliness that is prevalent in most shoujo manga series. Still some whimsical-ness, but it's not over the top. Hijiri has great potential to be a stupendous ballerina. You could argue that her quick rise is a bit unrealistic given that her training in her rural community was significantly lacking. But we see in this volume that Hijiri doesn't just start winning contest after contest. 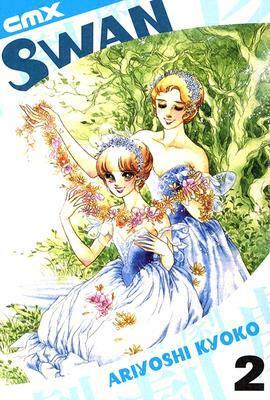 She comes in second in a dance-off between her and Princess Sayoko for a starring role in a Moscow ballet. Don't you think that second is the worst place to finish? I'd much rather win a Bronze in the Olympics than a Silver, because at least with a Bronze you can be grateful that you medaled at all, but with a Silver you'd always wish you'd won. After the contest was decided, the plot waffled a bit too much. There was a snippet of a romance with a hot Cuban ballet dancer. But despite the synopsis playing up the tension, to call this a snippet of romance is being quite generous. Hijiri also said goodbye to her new friends as they traveled to other countries to train. And then Hijiri gets to go to London to train. On the way, she stops in Moscow to see Princess Sayoko perform. There was too much going on. I also have trouble telling some of the characters apart and remembering the names. Perhaps it's that the faces are too similar or perhaps the personalities are indistinct. I wish they had a page at the beginning of each volume introducing the characters as many series do. Regardless, it's a lot of fun to read about the life of an aspiring ballerina. And I can't help but laugh at the crazy 70s hairstyles and fashion. Plus references to Leningrad or the Soviet Union. I've hardly read manga centered on ballet. The only thing that comes to mind is Princess Tutu. On my part, I don't like it when the protagonist easily achieves what she wants. Not unless I am particularly attached to the lead. "There was a snippet of a romance with a hot Cuban ballet dancer." I like that this one is a traveling book! And, like Jenny, the "hot Cuban ballet dancer" just leapt off the page for me! Seems there needs to be more romance with this hot Cuban. A snippet just isn't enough. I wish I was able to do Manga Monday! I used to read lots of manga--well, what I mean is that I used to amass an entire series and then blast through it all in a day. I actually don't know much about manga series that are out there; I just stuck to the so-called classics (Kodocha no Omocha, Marmalade Boy, Ouran...). I think I'm going to start paying more attention to your Manga Mondays now, so that I can pick up recs! Thanks!